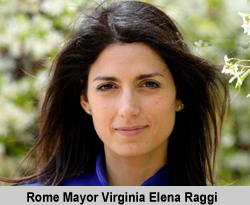 July 2018: Mayors play a central role in Italian national life and are a settled feature of the political system. The more than 8,000 communes are each headed by a mayor (sindaco) and elected council (consiglio comunale) of between 15 and 80 members. From the capital Rome to the smallest village, Italian communes coexist on an equal basis, although the mayors of Rome and Milan can be seen as national political figures in their own right. They also enjoy high levels of allegiance from their local populations, making their boundaries hard to amend or reform. In addition to civil registration and local public services, including roads, communes are able to run their own local police forces and provide local healthcare services. The Italian capital Rome is served by 19 municipal entities, the Municipi. www.comune.alessandria.it Gianfranco Cuttica di Revaliasco (Mr) Elected 2017 Candidate of Centre-Right list. Won in run-off in June 2017 ousting incumbent Maria Rita Rossa. . Born 1957. Degree in Medieval Art. Former Cultural policy professional. Popl: 76,060 Maurizio Rasero (Mr) Elected June 2017 Elected as candidate of the Centre-Right in the run-off with 55% of the votes. Re-elected in 2017 as Centre-Right candidate. Elected as Centre-Right candidate in the run-off in June 2017 with 52.8% of the votes. Medical doctor. Won this left-wing stronghold as a unified Centre-Right candidate. Not a member of any political party. Born 1959. Long career in private sector corporate management until 2016.Since 2015 he has been with computer consultancy Liguria Digitale. Former public sector manager. Defeated incumbent Centre-Left candidate as unified Centre-Right candidate. Ousted Centre-Left mayor as unified Centre-Right candidate in 2017. Party: National Alliance. Former mayor of Villa Sant’Angelo from 2004 - 2015. Launched the appeal after the earthquake. Journalist and public relations professional. www.laspezia.it Pierluigi Peracchini (Mr) Elected 2017 Born 1964. Won as Centre-Right unified candidate in June 2017 unusually with support from Civic List. Secured a decisive 60% in the run-off. www.comune.lecce.it Carlo Salvemini (Mr) Elected 2017 Ousted FI member mayor as candidate of Centre-Left in June 2017. Secured 55% of the vote in the run-off. Born 1966. Politician. Popl: 45,100 Sara Casanova (Ms) Elected June 2017 Born 1977. Architect. City Councillor since 2013. Party: Northern League. Centre-Right candidate in the 2017 election. Won the run-off with 57% of the votes after trailing the centre-left candidate in the first round. Subsequently secured some Civic List support. From 2010-2015 Sala was the Chief Executive Officer of the organisation running the 2015 Universal Exposition in Milan. www.comune.monza.it Dario Allevi (Mr) Elected 2017 Born 1965. Former bank trader. Elected mayor as unified Centre-Right candidate. From 2009  2014 President of the Province of Monza and Brianza. Former Deputy Mayor of Monza. Entrepreneur with a sports goods business and also holds positions in other companies. An independent who labels himself an environmentalist he secured the position as Centre-Left candidate in the 2017 election and won the run-off with 51.8% of the vote against the former mayor who had been removed in 2016 and replaced for the rest of the term by a special commissioner. Born 1973; Banker/Financial Consultant. Loves Computers. Elected in 2012 for the Five Stars Movement. Left the party in 2016. Re-elected in the run-off in June 2017 with 57.8% of the votes contesting as an Independent with the backing of a group on the council who have also left the Five Stars Movement. Patrizia Barbieri (Ms) Elected 2017 Won as unified Centre-Right candidate.58% of the vote in the second round. Born 1960. Jointly owns a law firm in Piacenza. Qualified as an advocate in 1984. Former mayor of the town of Castelvetro Piacentino. Former Province Cllr. First directly elected female mayor of Piacenza. www.comune.pistoia.it Alessandro Tomasi (Mr) Elected 2017 Born 1979. Lecturer. Candidate of Centre-Right for mayor in 2017. Defeated Centre-Left incumbent with 54% in the run-off despite trailing heavily after the first round. Party: Brothers of Italy  National Alliance. www.comune.taranto.it/ Rinaldo Melucci (Mr) Elected June 2017 Replaced long-term mayor Ippazio Stefano as Centre-Left candidate in 2017 elections. Won narrowly with 50.91% of the votes. Born 1977. Entrepreneur. Former Head of Taranto Prison. portale.comune.verona.it Federico Sboarina (Mr) Elected June 2017 Born 1971. Attorney. Defeated the candidate supported by Civic List predecessor with 58% of the vote in the run-off as the unified Centre-Right candidate though not a member of a party himself. Sinistra Ecologia Libertà (Left Ecology Freedom), left-wing party led by Nichi Vendola, initially founded as a coalition of leftist parties. Italia dei Valori (Italy of Values), centrist and anti-corruption party led by former anti-corruption judge Antonio di Pietro. Partito Democratico (PD, Democratic Party), social democratic party founded in 2007 in merger of left-wing groups including former communists. Movimento 5 Stelle: Anti-establishment, populist "Five Star Movement"; since 2018 in a national coalition with the Lega. Right-wing coalition: Originally a centre-right coalition formed and dominated by Forza Italia. Now a right-wing coalition dominated by the Lega.